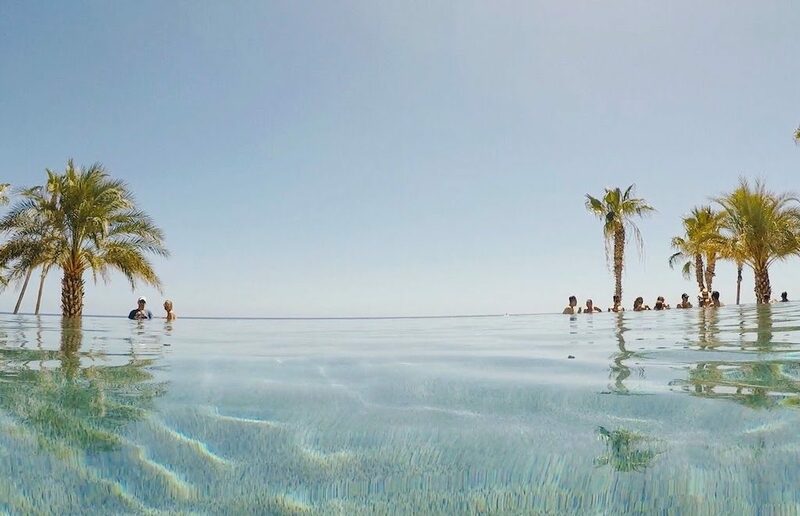 Cabo San Lucas, or “Cabo”, is on the southern tip of Mexico’s Baja California peninsula and peppered with resorts along the coast. I found some amazing deals on flights so Jeff and I decided to book it on a whim and invited my mom to join us. We had 4 full days there and a travel day on each end of that. 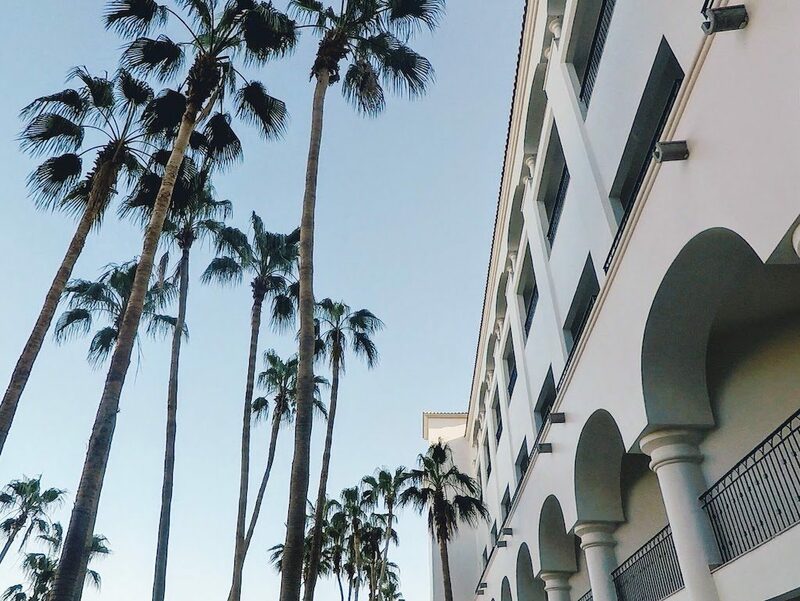 This was also a work + travel trip for us where Jeff and I worked remotely from our hotel (poolside, room balcony, or lobby). 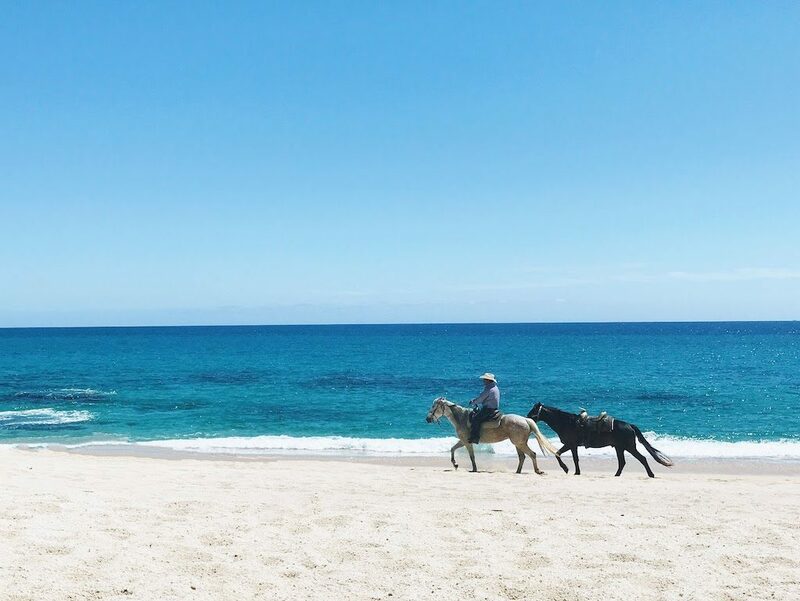 Here is my ultimate guide to Cabo! Getting around: Taxis and shuttles. When you arrive at the SJU airport and before exiting the building, you’ll be asked if you have a ride. We got a shuttle from there (you can trust it) and they drop off at local resorts and hotels. When leaving your hotel, just ask the concierge and they can arrange for a taxi/shuttle. Originally, Jeff and I just planned to stay at an Airbnb in downtown Cabo, but when my mom decided to join us, she insisted on staying at a resort (she’s fancier than us) and I’m SO glad she did. 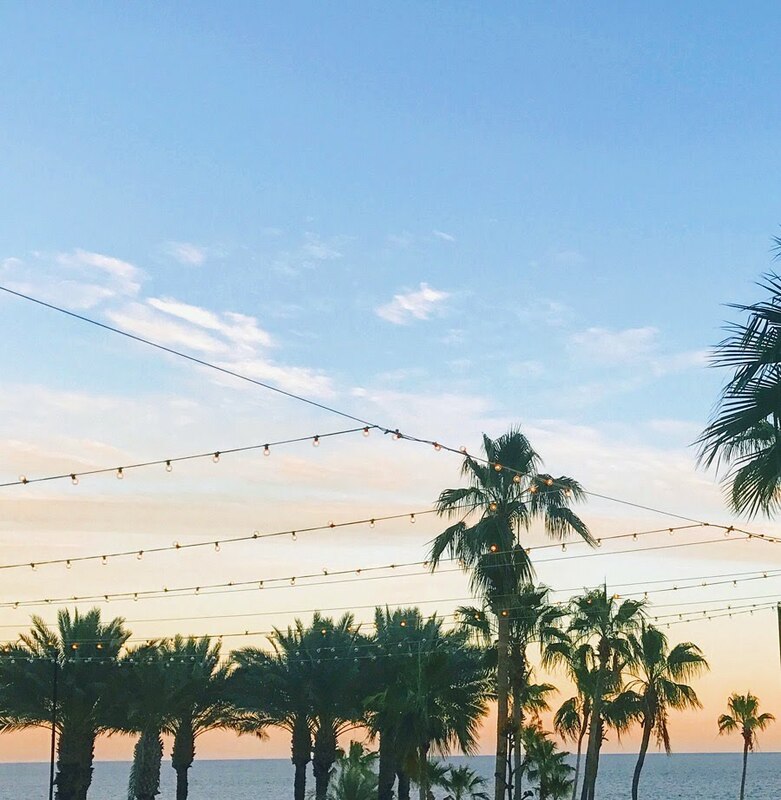 Cabo is a resort city and you can definitely go the more budget-friendly route but just trust me, you’re going to want to stay at one of the resorts. 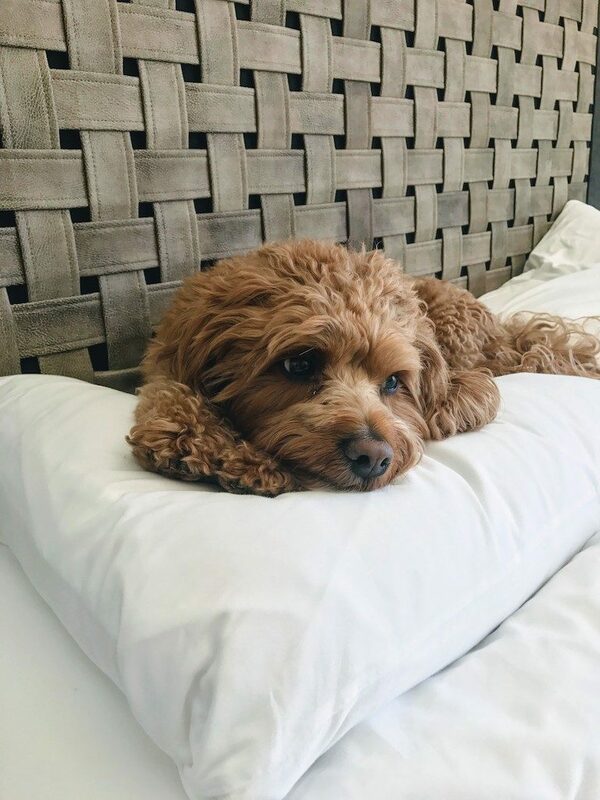 We had a nice private beach, infinity pool, beach bars, and our room close by so we could work some and be with our dog, Leon. Lounging by the pool on our “lunch breaks” was incredible. Hilton Los Cabos Beach & Golf Resort was absolutely stunning! Our room was fantastic with a gorgeous balcony view and everything about this place was pristine along with kind, helpful staff. There are 2 pools, one of which is an infinity pool overlooking the ocean (!!! ), swim-up pool bars where you can also order lunch, cabanas all over the place, a clean and private beach which was perfect for relaxing, and an amazing beach bar with swings as seats. 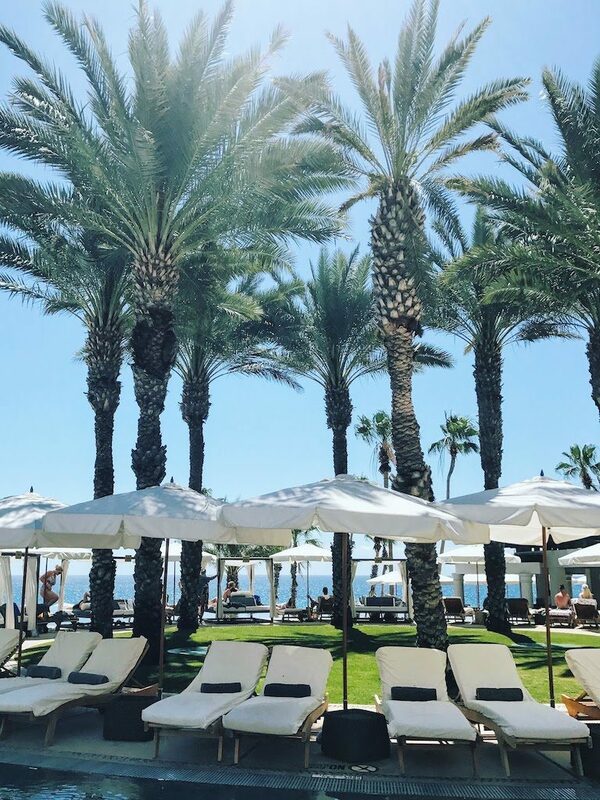 We spent some good quality time relaxing by the pool and beach and had more plates of nachos delivered to our poolside chairs than we may want to count. Of course, there are lots of other resorts along the coast but we couldn’t have asked for a better place to have stayed. We were also looking into The Cape – a Thompson Hotel. 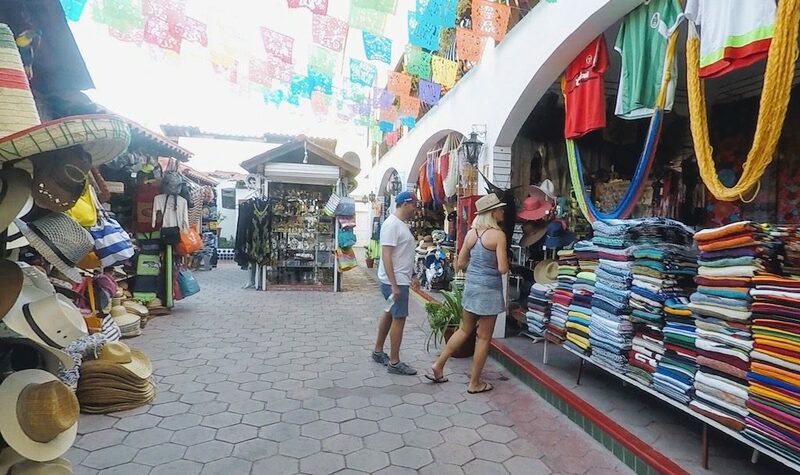 This is a tourist city made obvious by seeing the same type of shops along the streets selling similar things (hats, Mexican blankets, ponchos, etc), and even though I say that, it’s still super fun to walk around and pop in some of them to look around. My mom got a hat that I now envy and wish I had bought. Walk around the marina – There are tons of bars and restaurants along the marina walk. There’s a sailboat docked here that looks like an old pirate ship called ‘Bucaneer Queen’ which is kind of cool to see if you’re into that (like Jeff is). Medano Beach – This is the main public beach. Several bars and restaurants also line this shoreline. To be honest, I didn’t love this beach because it was pretty crowded with people but great to walk along to get to some of the restaurants (some options are mentioned below!). This was probably my favorite memory of this trip. 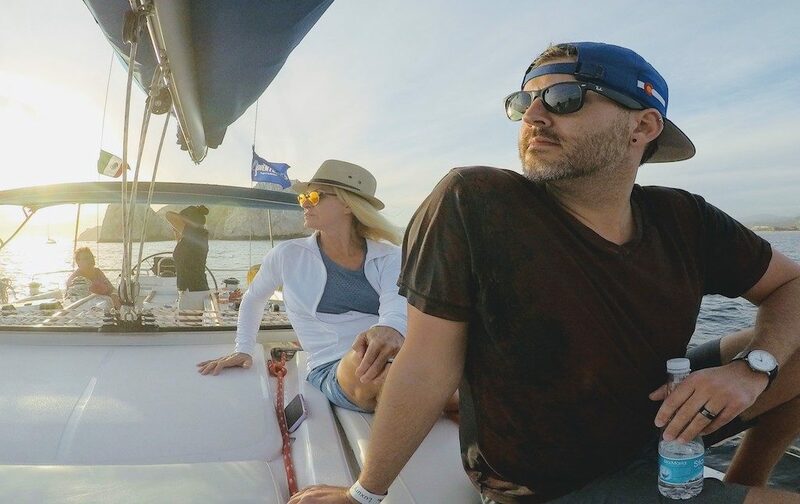 We booked a luxury sailing excursion through Cabo Adventures where we went sailing around Land’s End at sunset. It was magical! They served cocktails and served some delicious appetizers too. 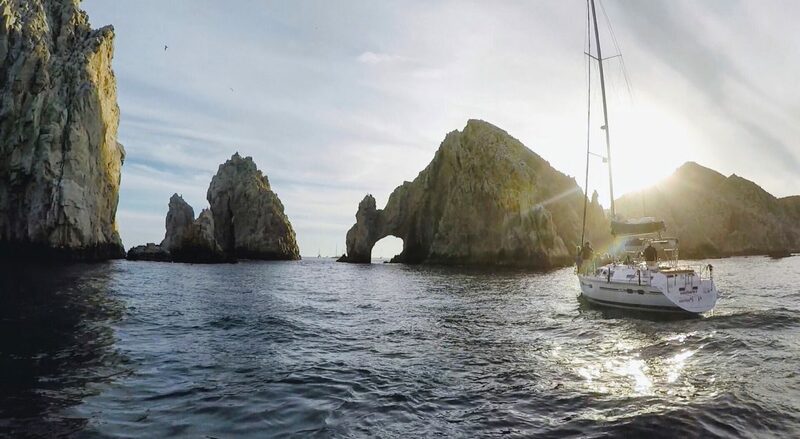 Along the trip, you get to see major sights like Lover’s Beach, Divorce Beach, The Arch of Cabo, and if you’re lucky, some sea lions and maybe even whales depending on the season. Cabo Wabo is probably the most famous bar/club in Cabo. It’s owned by the legendary Sammy Hagar of Van Halen and is a large complex with bars and stages where you can listen to some live music. 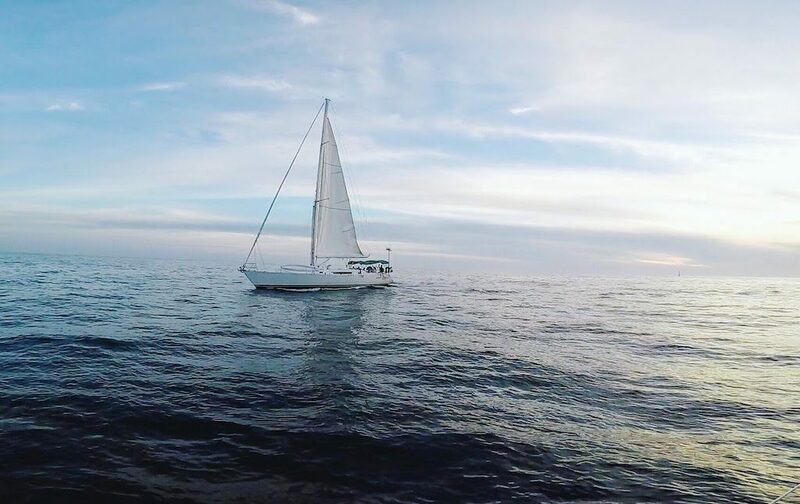 Cabo is known for its many options of water activities. You can likely book any of this through your hotel or just reach out directly to Cabo Adventures. If you’re wanting to take a break from lounging on the beach or pool and interested in doing something adventurous on land, this would be it. 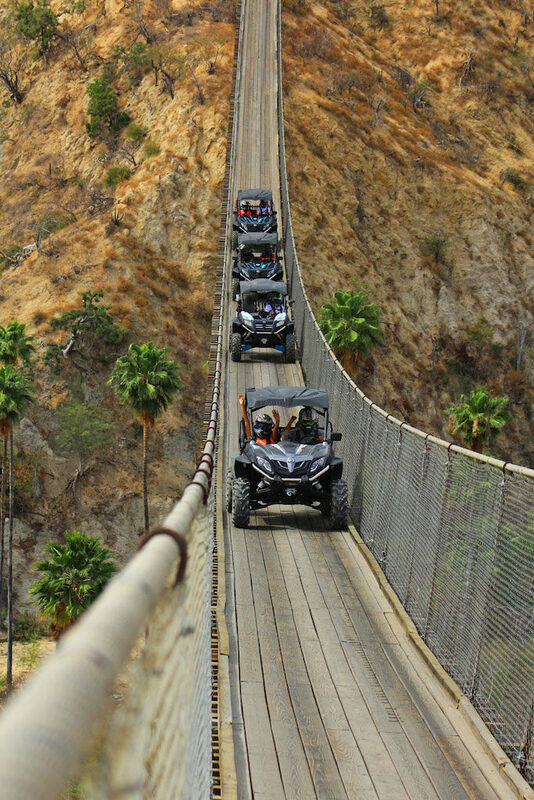 Wild Canyon offers ATV tours across different terrains and even the wooden suspension bridge. They have a lot of other activities to choose from too. We’re HUGE fans of Mexican food (Jeff is from Texas so his love language is tacos) so we were obviously very excited to eat while there! 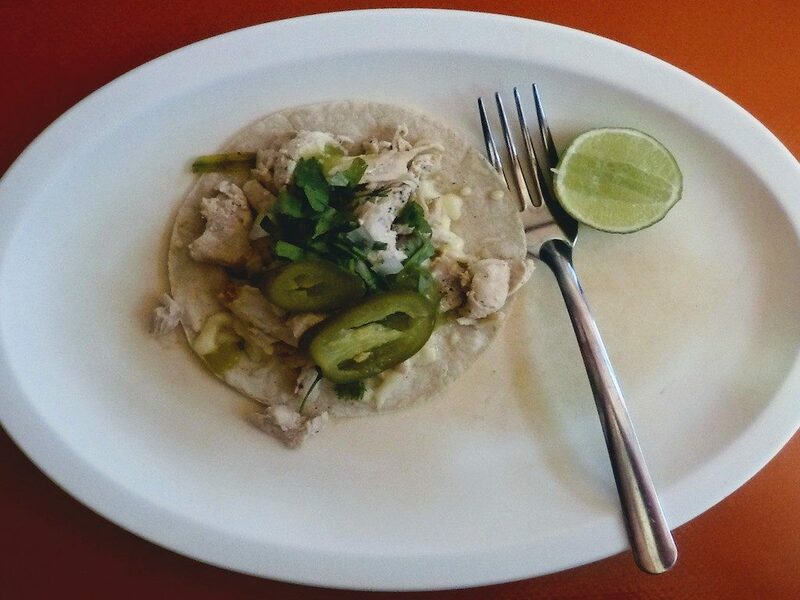 Taco Loco – This place is small and sits right in front of Cabo Wabo but man, it was amazing. The tacos were really simple but had so much flavor. We had salsa and guacamole too and it was all so fresh! SUR Beach House – After walking on Medano beach, we stopped here for an early dinner. The restaurant sits on the beach with a view of El Arco. It was an elegant yet laid-back place with the freshest ingredients. My mom and I split the nachos and Jeff had some sort of seafood tacos. Basically, we were all in heaven. * This is where we met our waiter, Ramon, who we got to do a little travel interview with. 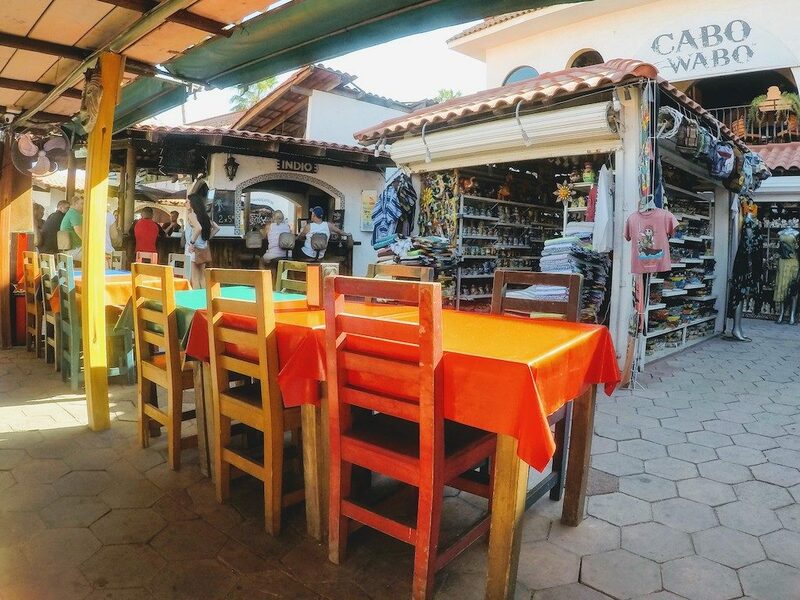 Mi Casa – This is a pretty well-known restaurant in Cabo. The food is good but you really go there for the fun atmosphere. 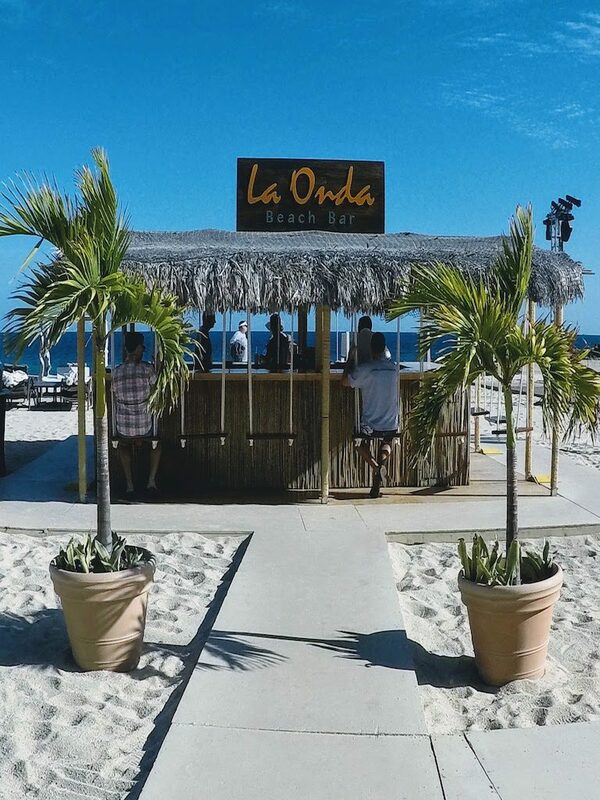 The Office on the Beach – Cabo is pretty laid back, but this is another well-known restaurant and one that you’ll need to make reservations for. It sits on Medano beach with a beautiful view and a really fun atmosphere. Definitely worth checking out!